One of the most easily personalized tattoo designs is that of a sun tattoo - not only is the sun replete with ancient and symbolic meaning, it is also combinable with other symbols and images, and can be placed almost anywhere on the body. In addition, the primacy of the sun in several cultures also means that you can use a sun tattoo to exhibit national or cultural pride. 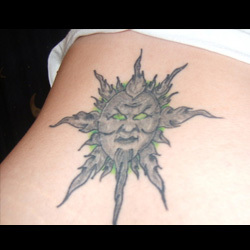 For almost every meaning you want to impart with a tattoo, a sun tattoo can do the job! As stated above, one of the reasons that a sun tattoo is a great choice for almost anyone is that it can be personalized in a myriad different ways. 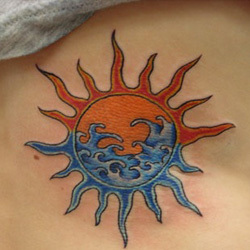 From color to additional symbols to personification, there are almost endless possibilities for your sun tattoo design! The sunrise we witness every morning is an affirming image of renewal and rebirth, and that each day begins anew and is full of exciting possibilities. Getting a tattoo of a rising sun can demonstrate your optimism for the new opportunities that each day brings. This tattoo has several different design possibilities, but whichever you choose you should try to include vibrant colors to symbolize the optimism of the new day and its possibilities. In general, the rising sun tattoo design should consist of a sun rising from a horizon: this could be a simple horizon scene of clouds, or it can be more personalized to reflect the place you live in or are from. For instance, denizens of New York City could have the sun rising over the Manhattan skyline or Brooklyn Bridge, or beach lovers could have the sun rising over an ocean or crashing waves. Another way to personalize this design is to personify the sun. In many cultures, the sun is a symbol of masculinity and seen as a protective entity; therefore, you may wish to give it somewhat masculine features, perhaps even inspired by your own father. This could be an especially meaningful design choice if your father has passed away, as the sun could therefore be a representation of him watching over you each day. 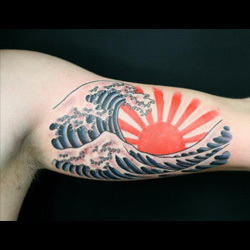 An especially popular rising sun tattoo design is that of the Japanese Rising Sun. Japan is widely known as "the land of the rising sun", and its national flag beautifully depicts this image in its bold, red and white design. This tattoo design is thus an excellent choice for anyone of Japanese ancestry or for those who have an affinity for Japanese culture. There are a few different options for this tattoo design. The simplest choice would be to get the traditional Japanese rising sun: a red circle with thick red rays emanating from it. This is well-placed on the shoulder or on the chest above the heart, both strong and vital locations that suit the sun's symbolism. To personalize this somewhat simple design, you can include a saying or word underneath in Japanese characters: you may want to choose "renewal" or "vitality" to emphasize the symbolism of the sun, or you may want to just have your name or important date written in Japanese characters. Another way to personalize this design is to have the Japanese rising sun over a particular scene or location that is meaningful to you - and it doesn't have to be somewhere in Japan! This can be a simple scene of ocean waves or a mountainside, or a more complex and detailed cityscape design. You can also play with colors when considering this option: having the city or other scene in greyscale but keeping the vibrant red of the traditional Japanese rising sun will the sun to stand out, or you may choose to get the entire design in either greyscale or full color. You can also play with the placement of this tattoo, choosing either to place it in a relatively small or obscure location on the inside of the wrist or back of the neck, or you may create an ornate design that fills your entire back. The choice is yours! 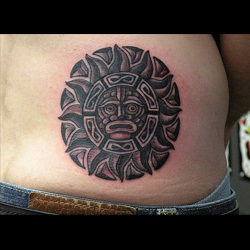 Another excellent design option for your sun tattoo is to adapt the tribal tattoo style for the sun. A tribal sun tattoo is a great way to encompass the energy and vitality that the sun often symbolizes: when done in this style, the bold flames or barbed wire design of the sun's rays come out of the dark circle of the sun, as though the entire shape is slowly spinning. While tribal tattoos are often done in plain black coloring, you may wish to eschew this tradition and opt for a bold yellow or red for your design. This will further personalize the design and also emphasize the sun's symbolic associations with life-giving power. The tribal sun tattoo is easily adaptable to any location on the body, making it perfect for both men and women. You may wish to have a small tribal sun on your ankle or behind your ear, or opt for a larger, bolder placement on a bicep or middle of your back. 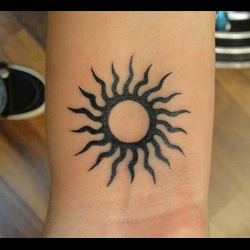 While a tribal sun tattoo is often black, a 'black sun' tattoo has a different meaning altogether. This particular design is of Germanic origin and features a black sun at the center, with its rays zig-zagging out through two concentric circles. Though this symbol was incorporated into a floor of Wewelsburg Castle in Germany during the Nazi era, the symbol itself does not necessarily have any racial or neo-Nazi connotations. Instead, it's most often found in occult circles of Germanic neopaganism. This design is thus an ideal choice for anyone of German origin, or who associates with this particular chapter of neopaganism. 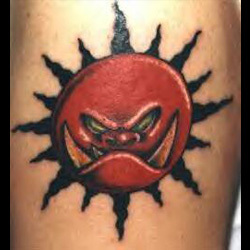 Getting an angry sun tattoo is an excellent way to clearly impart the raw power and energy that the sun so often symbolizes. For this design, personification is the key element, and the way in which you can make this tattoo your own. Decide on a face for your sun that best demonstrates your idea of anger: maybe that's a snarl and bared teeth that imply rage, or harsh, slanting eyebrows that connote ferocity. 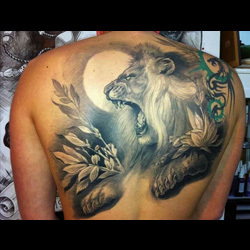 While this tattoo can be done in greyscale or plain black, a color tattoo is much more effective in capturing the bold brashness of the angry sun design, particularly if bright yellows, reds, and oranges are utilized. In Chinese philosophy, the yin yang symbol is representative of the balance of opposing forces: while yin represents such qualities as darkness, passivity, the feminine, and water, yang represents such qualities as lightness, activeness, the masculine, and fire. Joined together, these different elements find harmony and balance, thus represented in the yin yang symbol. 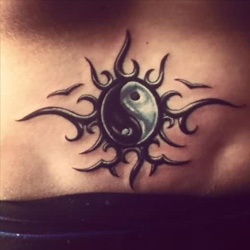 A yin yang sun tattoo still focuses on this harmonic balance, but the added imagery of the sun, a symbol of energy and vitality, highlights the inherent power in such balance. Most often, this tattoo design is accomplished by having the traditional yin yang symbol surrounded by sun rays or flames. While the yin and yang are traditionally depicted as black and white, one way to personalize this design is to add color in the sun: though you can keep the black and white motif and have the sun rays be black, adding a pop of vibrant color makes this an incredibly eye-catching design. As discussed above, one of the sun's most potent meanings is that of renewal and new beginnings. When combined with the image of the phoenix, another symbol of rebirth and renewal, this meaning is amplified even more. There are a few different options when designing a phoenix and sun tattoo. Traditionally, the phoenix rises from the ashes and is reborn; you can therefore depict the sun's fiery rays as the flames from which the phoenix is rising, or set the phoenix against a backdrop of a flaming sun. 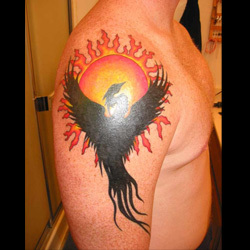 In either scenario, it is a great idea to have a solid black phoenix with a bright orange and yellow sun in order to create excellent contrast and make the tattoo pop. The lion is a symbol of strength, courage, and masculinity, making it a perfect symbolic pairing with the sun, another image connoting these qualities. One design idea for a lion and sun tattoo is to have the head of a lion facing directly outward from inside a circle (the outline of the sun), with its mane depicted as the sun's rays, emanating outwards. You can depict the lion as either calm and at ease, simply hinting at the power beneath its surface, or with its teeth bared and eyes focused, a more direct and potent image of its energy and ferocity. Another design idea that comes from Egyptian symbolism is to have two lions back-to-back with each other, all set against rising and setting suns. This symbolizes East meeting West, the sunrise and sunset, thereby reminding us of the cyclical, waxing and waning nature of life. Fire and water are two of the most basic and important elements in our universe, and by incorporating both the sun and water into a tattoo is a great way to highlight the necessary balance of elements needed for a harmonic existence. This is also a great tattoo design for anyone who feels a communion with the elements of nature, or who finds joy in being out on the water in the summer. 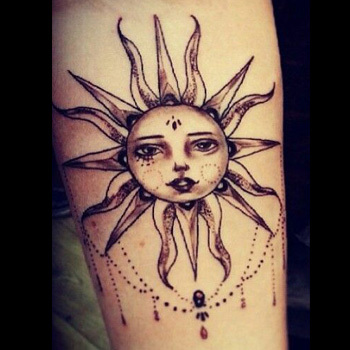 One design possibility for this tattoo is to combine the elements within the sun. For instance, have the bottom half of a sun be filled with water or waves, using color and outline to differentiate between the two elements: while the top half of the sun is a traditional yellow or orange, the bottom half would be blue, with a few wave shapes included to ensure the element of water is clearly represented. Another tattoo design option, perhaps more pertinent to beach-lovers, would be to have the sun rising or setting over an ocean. This combination of the elements, along with the personal significance of the ocean and the symbolism of either the setting sun (a chapter in your life has ended) or the rising sun (a new chapter is beginning), creates an incredibly powerful image. In addition to the Japanese rising sun tattoo, another sun tattoo that can display your national pride or cultural affinity is the 3 stars and a sun tattoo, which is adapted from the flag of the Philippines. This is the perfect tattoo for anyone from the Philippines or of Filipino heritage, as it is an instantly recognizable cultural symbol. 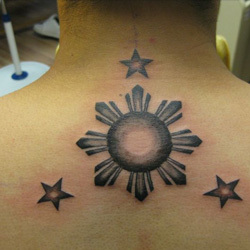 While this tattoo is often done in all-black coloring, one way to personalize it is to have the colors of the Filipino flag - yellow, blue, and red - incorporated into the sun and/or stars. Another design option is to have an outline of the islands themselves done within the center of the sun. To further personalize the design, include your family name or a favorite Filipino quote done underneath the stars and sun, further cementing your heritage and cultural pride within the tattoo. The sun is the center of our solar system, but it resides alongside the stars and moon and these elements create a balance in our ecosystem and other vital aspects of our life on earth. One design option to highlight this tangible impact on our daily lives is to keep the images realistic by including such elements as sun spots, topographical details of the moon, and your favorite constellation. Another, more whimsical design for a sun, moon, and stars tattoo is to have brightly colored celestial bodies that thereby reflect your own personality. You can also personify the sun, moon, and stars by including faces in them: this is especially meaningful if they represent your mother (moon), father (sun), and yourself and any siblings you may have (stars). They can also represent yourself, your partner, and any children you may have, thus creating a beautiful celestial family. The sun and moon together are often representative of balance and harmony: though oppositional, these astronomical bodies need each other as well. When putting together a sun and moon tattoo design, there are a few different options. One would be to have the sun and moon separate, often on opposite sides of the body: for instance, one on each wrist, ankle, or shoulder. Another option is to combine the two into one, with a half moon on one side of the circle and a half sun on the other side. In either case, there are several ways to personalize this design. You can personify the sun and moon by adding faces, perhaps representative of feminine (moon) and masculine (sun) elements, or indicative of their primary traits, such as calmness and serenity in the moon and active energy in the sun. There are also several design options with color, as you can keep things relatively realistic with a golden sun and a silver moon, or by being a bit more playful with your color choices. While the Aztecs had many gods, perhaps none is more recognizable or powerful than the sun god, Huitzilopochtli, who served as the guardian of heaven. Getting this sun god tattoo can therefore serve as a link to your ancestors or heritage or as a visual representation of your inner power and strength, and your role as a protector. For this design, you can either have a physical representation of the god, done either in black outline or in vibrant colors such as greens, yellows, and reds, or you can depict the god's face on an Aztec shield in the shape of a sun. The latter design is incredibly intricate and utilizes other symbols as decorative elements on the shield, thus giving you an inordinate amount of opportunities for personalizing the design to include symbols that you believe to be indicative of your own personality. This design can be done in any color, but a simple black is perhaps best as it allows the symbols and overall design to take center stage. Whether you're a man or a woman, young or old, a sun tattoo is a great way to express yourself through a meaningful symbol that is both ancient and eternal. The sun is easily adaptable in size and color, allowing it to fit almost anywhere on the body and be in any design that you choose! 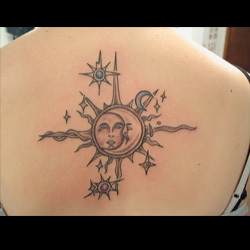 For custom design of a Sun, you can check our Custom Tattoo Page.